We are living with one baby chicken. We didn’t plan it that way but the other chicks traveling with her did not survive. I had ordered nine, and she was the only survivor of what our shipper told me was a very rare occurrence. So we ordered eight more chicks, and they should be here in about five days. Yesterday morning around eight we got a phone call from our local post office that we had a package. 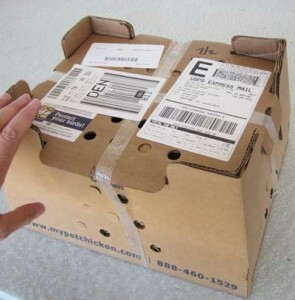 “Our chickens!” I whooped, and drove into town, where I picked up a small box. On the way home, I was a little surprised that the cheeping coming from it wasn’t noisier, but it wasn’t till my husband Kelly and I opened it that we discovered our little girl cheeping in the middle of the box was the only one alive. A very sad moment. There was a heat pack next to her, but most of the baby chickens had somehow gotten wedged between the insulation and the cardboard of the box. Both Kelly and the customer service guy we spoke to later thought it sounded like the box had been handled roughly, probably turned upside down. So… what to do for our one little girl? 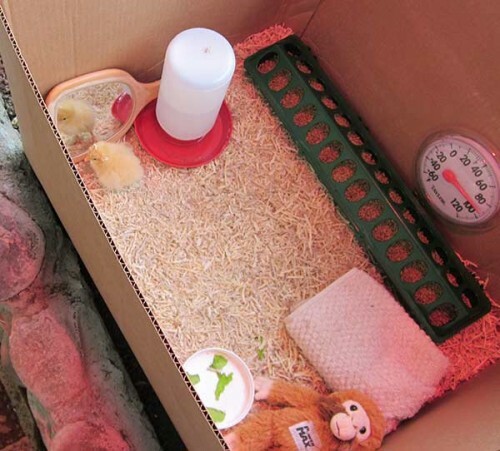 We had a cardboard box with heat lamp , thermometer, feed, and water, for all of the chicks. She looked mighty tiny in there all by herself. 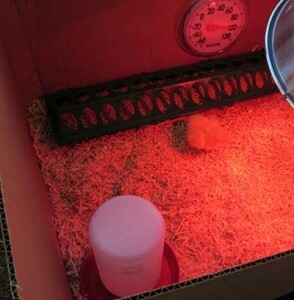 By the way, when we got a heat lamp for the chick brooder that the cardboard box would be, I got a red one because it is a less glaring light and thus easier for the chickens to sleep with at night. I kept checking on her every 20 minutes or so. Was the temperature right? 95 is about perfect for the first week, and we raised or lowered the heat lamp to get it right. 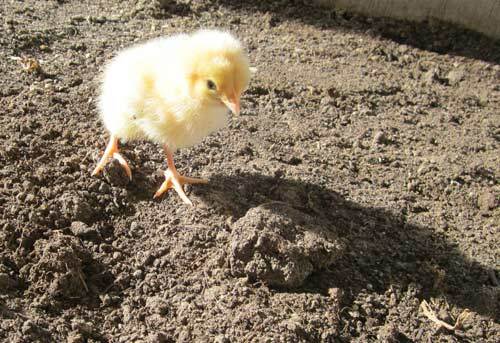 It was easy to check on her because we had set the brooder up in the greenhouse attached to our house. Our dogs and cats are not allowed in there, and we keep a screen door latched or a regular door closed so they can’t get in. At this time of year, the greenhouse gets very little sun and thus wouldn’t overheat. It is a perfect place; I’m kinda glad our chicken coop isn’t finished yet. I got online and went to Backyardchickens.com, which has a very active forum. I posted what had happened and asked for advice. I got lots of good wishes and good tips. One of them was to put a stuffed animal in with her, and it happened that there was a stuffed animal in the house, one that had come as a surprise with my Mac computer last year. I put that in, and she sat on it… she didn’t seem to like the wood chips as well. She ate, she drank, she pooped, and she sat in my hands. I was picking her up whenever I checked on her. Buff Orpingtons are known to be friendly, and I would guess this one will be extra used to people. She pecked at my wedding ring and at my buttons. Right away we had phoned the feed stores in our area, but it was too late in the season and they were all out of chicks. I went on Craigslist, another of the ideas I got from the friendly folks in the forum, but the only chicks I found were a four hours’ drive each way and that was not going to happen. I asked on a private Facebook group for our small town, and got ideas of some local chicken breeders. There I struck paydirt… not for another baby chick, but a local woman had what turned out to be an absolutely great idea. A mirror! I put a hand mirror in the box, and our baby became inseparable with the chick in the mirror. So here is what the setup looked like by yesterday afternoon. By the way, she liked pecking at the bits of lettuce from our garden, but I don’t know if she actually ate any yet. Once the mirror was in, that was her spot, and she slept right next to it last night. 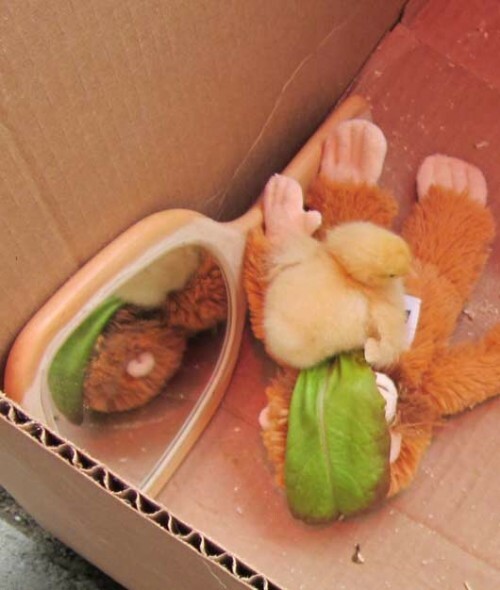 When we fixed up the box, I moved the stuffed animal over by the mirror, and added a bit of lettuce. No surprise that that is her favorite spot. Sorry to hear about the chicks who didn’t make it, but I’m glad you have your Sunshine! I was very sorry to recently discover our local zoning prohibits chickens. I know of several people in the area keeping them, but I’m not ready to go ‘a-fowl’ of the law just yet. Sure would like some fresh eggs, though. Aww what a cute little chick, sorry to hear that the others didn’t survive. Love it! Soooo cute and a happy outcome! Great photos of sunshine!